Communal worship is intrinsic to theological education. A seminary is an academic institution, but a unique one in that our goal is to know God truly. As we learn about God in the classroom, we are compelled to glorify God–to devote ourselves ever more deeply in service and worship to the one we have come to know. Chapel services at PTS are a time of corporate worship in which we gather–students, faculty, and staff alike–to glorify the Triune God through the proclamation of God’s Word, prayer, song, and Sacrament. The Worship Program offers exposure to varied worship practices of different denominations, traditions, and cultures with the awareness that God transcends each of these practices. We come to know God more deeply and embody Christ’s body more fully as we engage a diversity of worship practices. All are welcome to the worship life at PTS–both from within and beyond the PTS community. 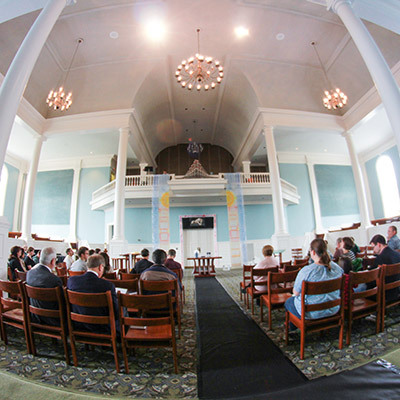 Corporate worship is held in Hicks Memorial Chapel Tuesday-Thursday when classes are in session. Mid-day Worship 11:30 a.m-12:00 p.m.
We engage a wide variety of worship practices including (but not limited to) Morning and Evening Prayer, Taize, praise and worship, services of the Word, services of healing and wholeness, and services of Holy Communion. Worship is planned and led by students, faculty, staff, and guests. Students also host Bible study and prayer groups on- and off-campus. Special services are held throughout the academic year, which reflect the liturgical calendar and the life of the community. Explore the links below to learn more about the Worship Program at Pittsburgh Seminary.